Welcome to “Las Escaleras” on Mallorca! In the privileged south-west of the island of Mallorca, close to the village of Port d'Andratx, our small, privately-run holiday complex “Las Escaleras” is situated directly in the bay of Cala Llamp. Due to the terrace construction of the houses, each apartment has an unobstructed sea view towards the southwest - spectacular sunsets included. Our offer with different sized apartments, various pools for private or community use as well as the spacious terraces offers the right accommodation for every holidaymaker - whether it is romatic for a couple or with the whole family. The holiday apartments and holiday homes of our small complex “Las Escaleras” on Mallorca, in keeping with the Mediterranean style, are situated on the pine-covered mountainside of Cala Llamp with fantastic sea views (south-west side). The houses are built in the terrace style right into the steep hillside. 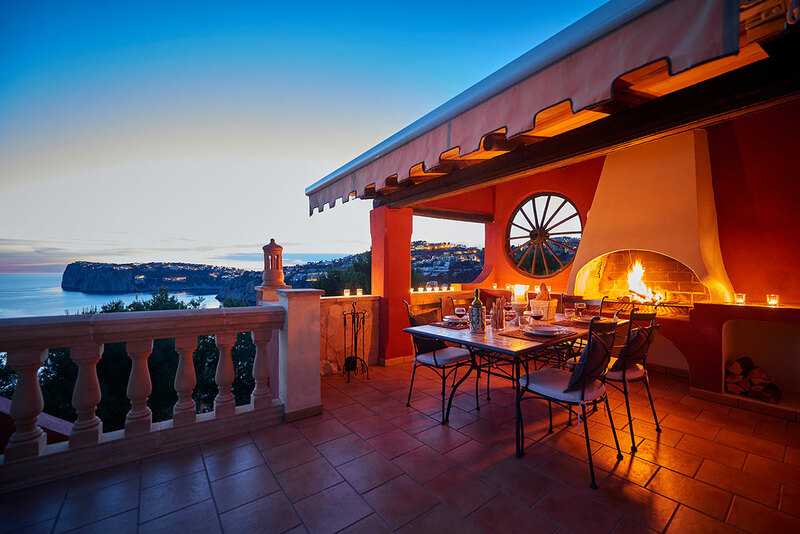 Every house has a large outside area with romantic terraces where you can sunbathe, daydream and enjoy the spectacular sunsets. Natural stone steps lead down to the houses, which are built in the cheerful Mediterranean style. All houses have a spacious living and dining area with fireplace, kitchen, bathroom and bedrooms. There is a lift to the houses from the street below. Our small complex “Las Escaleras” in the bay of Cala Llamp is located on a peninsula near Port d'Andratx. This southwest coast harbor town has preserved its typical, picturesque character despite the general development in tourism. No large hotels or large apartment buildings, but villas and small complexes shape the image and ensure an exclusive holiday experience. Port d'Andratx with its small streets and the natural harbor is a delight. Many restaurants line the promenade opposite the Yacht Club. The harbor belongs to the town Andratx and thus to the municipality of Calvia in the southwest of Mallorca. 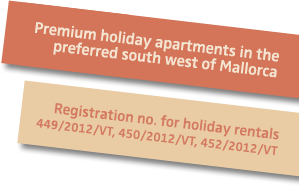 Of course, our holiday resort is officially registered with the tourist authorities. Our registration numbers are: 449/2012/VT, 450/2012/VT, 452/2012/VT. Do you want to travel with more than 6 persons? Please do not hesitate to contact us – we offer discounted combinations!